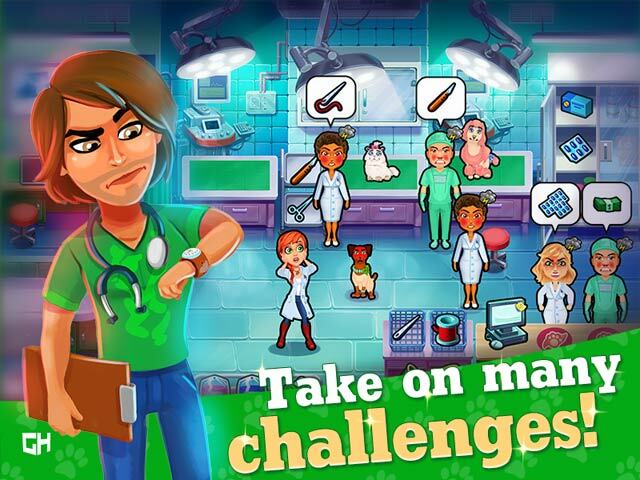 In Dr. Cares Pet Rescue 911 Collector's Edition, you'll get the chance to become a real vet. 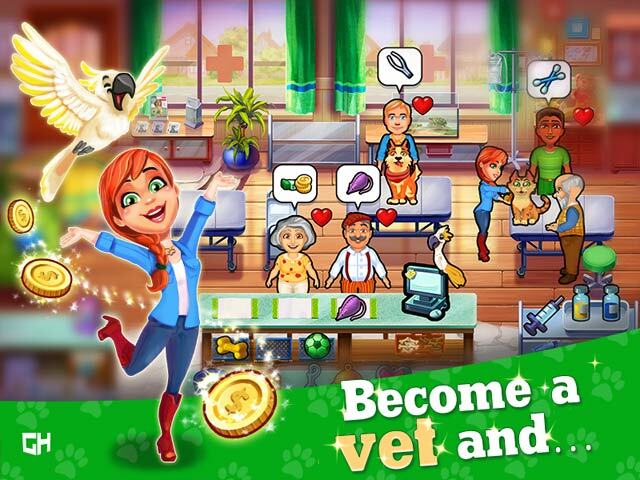 Take care of adorable animals across 6 fluffy chapters, perform special treatments, and upgrade your clinic! But who is this Dr. Cares? Let's introduce you! Born to take care of pets and other animals, vet graduate Amy Cares decides to leave her grandfather's vet clinic behind to take a job at a prestigious clinic in New York. It seems like a great place to help animals and really make a difference, but can she stay true to what she believes and resist the many distractions the big city has to offer? Enjoy this pet rescue time management game brought to you by GameHouse, the creators of the Delicious and Heart's Medicine series! 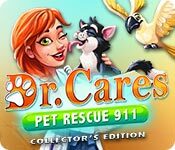 Dr. Cares Pet Rescue 911 Collector's Edition is rated 3.5 out of 5 by 22. Rated 4 out of 5 by ringcat from good game but not as challenging as other TM games This is a good game but it was not as challenging as other TM games. . I had it on expert mode and i cleared through the levels with ease. Its still a fun game and good story line and i enjoyed the game. Just wish it was a bit more challenging. Rated 3 out of 5 by mir2323 from Too Easy I usually love these games, but this one was way too easy. I didn't have to struggle finding the mouse on any level or even getting three starts. All the challenges were easy to meet as well. If I pay for a game, I want to at least be somewhat challenged. That being said, great quality and graphics as always. Rated 3 out of 5 by Hrobarka from Veterinary ambulance without strain. Pity ... I was looking forward to a new game from Emily's creators, but I'm disappointed. The game is very simple, even an expert is extremely easy to get the maximum stars. The game is lacking in tension, every episode passes without enthusiasm for the game. Expert mode should be for experts, not for dolls. Rated 3 out of 5 by Bumbles2 from Pets and Vets !!! I love TM games but I felt this one was lacking a thing or two !!! I had a lot of fun to begin with...but then when there was very little guidance as to what to do and how to obtain the bags on the left side of the screen...it became rather annoying. I found there was very little tutorial in this game which was also annoying!!! The graphics were magnificent and so was the music...I quite enjoyed both. I liked the storyline about a young girl who just recently graduated from Vet school and then she went to work for her Grampa...but she actually wanted to work in New York City. One other thing that I didn't like about this game...is there was way...way..too much chatter...if they just cut the chatter to about half I probably would have loved it more. Sorry guys...it just didn't tickle my fancy !!! Rated 3 out of 5 by debbersgame from I dunno - not so great for me Full Disclosure: Running Mac version on 2017 MacBook Pro Additionally, I do not read storylines and I usually play with all sounds muted. I only mention visuals if they are bad. This is not a MKFTP game, but I realize not everyone likes that kind on TM game. IF YOU PREFER THIS TYPE TM GAME (i.e. Emily's . . .) - THIS IS PROBABLY A GREAT GAME FOR YOU, AS LONG AS YOU PLAY THE TRIAL FIRST TO CHECK OUT THE CURSOR. The game itself is not "that" original from some other games. There is one in particular, that I can't remember the name of, where you need to find a small mouse while your doing each level, well this game is practically the same game. You even still need to find the mouse in each level. If you liked that one, you should like this one. I had the previous game and I believe I played it through so when I was playing this trial and realized this was basically the same and I thought I would at least complete the trial, but alas, I couldn't due to reasons below. AFTER READING THE OTHER REVIEWS AND NOT SEEING MY PROBLEM MENTIONED, I realize that it may be the version (Mac) or my computer causing the problem. Regardless, I recommend that you definitely make use of the trial before making your purchase. My problem with this game was the teeny tiny cursor. If the cursor was so little in any other type game it wouldn't be nearly as bad, but in a TM game, it's the worst. It's really important to be able to spot/see your mouse at all times when playing TM games - after all you are trying to beat a clock. If you spend part of your time looking for your cursor, its such a pain. Yes, you can still win the levels (at least the ones I played) with all of the bonuses (I like to complete each level with 3 stars, or whatever the game has as its best marks) with the tiny little cursor, but what a pain. If there were an option for a special cursor, like some games have, it would be much better. Rated 3 out of 5 by imschmarte from Purrfectly boring I tried this because 5 reviewers each gave it a 5, and I am a big fan of the Emily/Delicious games. I played on Medium, and I just don't see the draw of the game. To me it was boring, tedious, and not all fun. You do the same things over and over, and they incorporate a lot of the game within the game, like Emily series, but they were all the same, needed something new, not the same old, same old. Try it for yourself, but the best I can give this is a 3 star. I would only recommend it if you have a long afternoon, and have nothing else to do! Rated 2 out of 5 by Alexiell from Too easy and childish. I love the games of this developer who are varied and stimulating; Delicious, Fabulous, Maggie and company. This one is not up to par. I made the whole game, including bonuses, as an expert and the difficulty is non-existent. Without improvement and without combo I got the three stars easily. The mouse is ridiculously visible, the mini-games offer no difficulty and the story is more or less interesting. The characters laugh stupidly for everything and for nothing, constant and annoying vocal interventions and so-so graphics. In short, I'm disappointed with this first easy and infantile game. Rated 2 out of 5 by eva338 from Disappointed I love TM games and as another reviewer stated, I have to wait forever for the kind where you're not building something. 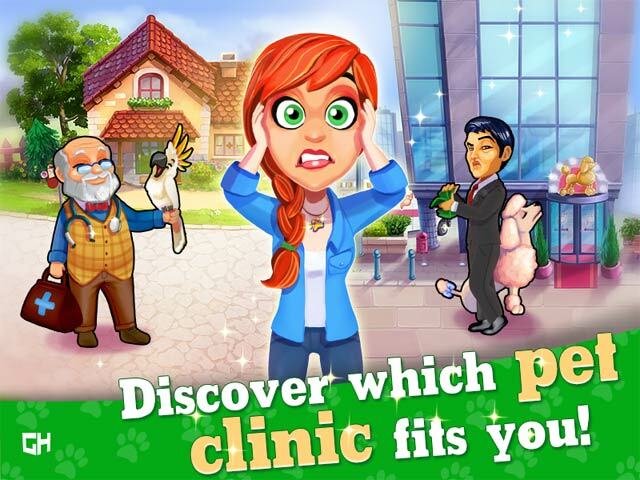 So I was excited when this game came out because I thought it would be like Happy Clinic, which I love. However, this game isn't fast paced at all. It's quite tedious, repetitive and slow paced. I also disliked the iv and play toy games where you had to click just the right way to get the needle to stay in the green. The games didn't involve much skill and they repeated themselves throughout the levels. I bought the Collector's Edition thinking it would get better after the introductory levels, but I got to level 42 and then uninstalled the game. The animals were cute and I liked Jack, the doctor, but not enough to save the game. Rated 2 out of 5 by watson1212 from way to easy As the first reviews came in I bought the game - oh dear I was disappointed. Not at all a challenge - I started out with the expert version and not once did I have to replay a level - way to easy - there should be much more difference between the versions to call it - and charge it Collectors Edition. Rated 1 out of 5 by tugar04 from This game is very boring. It does not move onto more challenging things to do. This game is not worth the money. Rated 1 out of 5 by n_an11 from World's most boring game I love most of the Emily and Angela games and since this one had such great reviews, I bought it. Unfortunately, this game doesn't have the same charm. In fact, I wonder how others gave it such a high rating. Once you've played the first level, it never gets more interesting or challenging. I found it really tedious and felt like I was just doing the same thing again and again. Supremely dull and a complete waste of money.